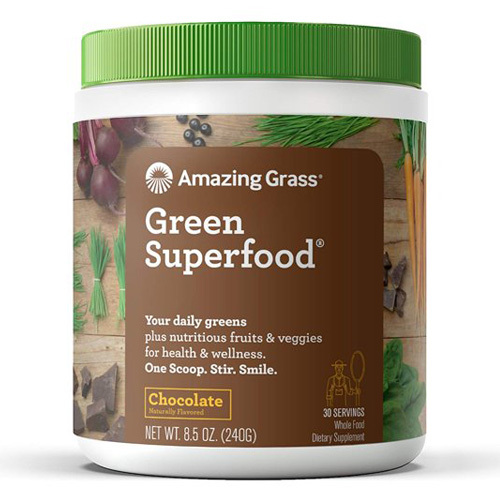 This thoughtfully crafted blend combines farm fresh greens and wholesome fruits and veggies with nutrient-rich superfoods plus cacao for an indulgently delicious way to feel amazing every day. Amazing Grass grow and harvest the most nutrient-rich greens on their family farm in Kansas and craft them with the highest quality plant-based ingredients curated from around the world. GREEN FOOD BLEND (47%) (Organic Wheat Grass, Organic Alfalfa, Organic Barley Grass, Organic Spinach, Organic Spirulina, Organic Chlorella (cracked cell-wall). CACAO BLEND (Organic Cocoa, Redwood Cocoa, Organic Cacao). FIBRE BLEND (Fructooligosaccharides, Organic Flax Seed, Apple Pectin), Natural Flavour. FRUIT & VEGETABLE BLEND (3.9%) (Organic Carrot, Organic Acai, Organic Rose Hips, Organic Beet, Organic Maca, Organic Pineapple, Raspberry, Acerola Cherry Extract (Malpighia glabra L., fruit) Green Tea Extract (Camellia sinensis, leaf)), Sea Salt, Anti-Caking Agent (Silicon Dioxide), Peppermint Leaf. ENZYME BLEND (Lactobacillus acidophilus, Protease, Amylase, Lipase, Lactase, Cellulase). Simply add one scoop to 250ml water. Also enjoy in a non dairy milk. Below are reviews of Amazing Grass Chocolate Green Superfood - 240g by bodykind customers. If you have tried this product we'd love to hear what you think so please leave a review.